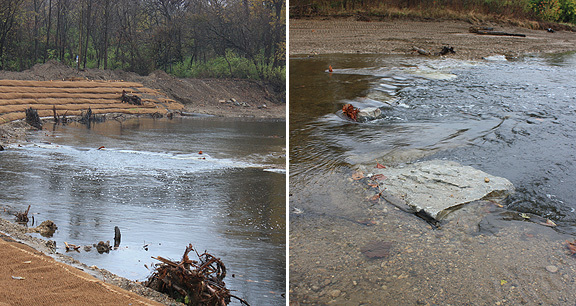 Project obstacles and solutions: Starkey Park in Zionsville, Indiana was experiencing significant soil erosion along a 1,000 foot section of one of its main trails. Eagle Creek runs through the park. Flooding often occurred at one particular bend in the creek. The erosion was significant enough that the Zionsville Parks Department feared the permanent closing of the trail. Zionsville officials contacted Flatland Resources to create a plan to redirect the flow of water in the creek away from the eroding bank. Flatland specializes in river and stream erosion control. In order to do this, Flatland diverted the water back to the middle of the creek by constructing two j-hooks from large stones placed side-by-side in a curved motion away from the bank. However, not just any large chunk of aggregate could be used. The Indiana Department of Environmental Management (IDEM) regulates any items placed in public waterways throughout the state. Flatland turned to IMI Aggregates to supply rough hewn limestone boulders for the project. IMI suggested they use Salamonie Dolomite Limestone since it is relatively flat and stacks well. Also, limestone is a native stone that is found naturally in Indiana's waterways and is accepted by IDEM. Flatland hand selected 200 tons of limestone boulders from IMI Stony Creek quarry to use in Eagle Creek. The boulders were selected for their flat, stackable shape and size, with each one being 4 - 6 feet long. The stacked boulders create a barrier that redirects the majority of the water into the middle of the creek. For more information on stone from IMI Aggregates, click here.